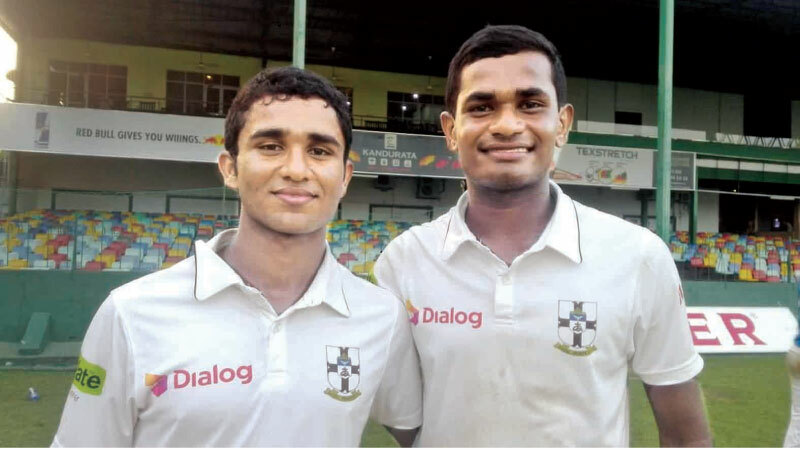 Thomians Ravindu de Silva and Umayanga Suwaris shared a triple century partnership of 338 against Nalanda. S. Thomas’ College Mt. Lavinia entered the final of the ‘Singer Trophy’ Under 19 division 1 inter-schools 2-day cricket tournament when they beat Nalanda College in the semi-finals on bonus points at the SSC grounds yesterday. The Thomians winning the toss and batting first ran up a mammoth first innings total of 551 for 9 wickets off 165.4 overs. The feature of their innings was the triple century fifth wicket partnership of 338 off 624balls between Ravindu de Silva (213) and Umayanga Suwaris (155). De Silva faced 387 balls and hit 22 fours and a six, and Suwaris 308 balls with 17 fours and a six. Dineth Samaraweera took 4 wickets for 57 runs for Nalanda Jithesh Wasala 3 for 75. Nalanda left with 19 overs to bat for the day made 61 for 2. The match will be continued today. However with 6.01 bonus points as against Nalanda’s 2.86 points, the Thomians have qualified for the final.